Christmas Day is past the halfway mark and as the presents have opened and the egg nog is flowing through the system, it’s time to unleash a few wishes for the upcoming 2015 season. Every baseball fan hopes for the best and trains for the worst, but with the holiday spirit in the air, here are a few things I want to see happen with the St. Louis Cardinals in the New Year. *Mike Matheny learns from his mistakes and becomes a better in game manager. I don’t have to reach far back in time to tell you the man struggles in late game action chess play. Take the Giants series. He left Randy Choate in too long and a game was blown. He finally unleashed Michael Wacha at the WORST possible time and the series was lost on one flat pitch. Matheny is a good guy, a firm leader and someone the players trust. He has the look of a ranked officer but makes rookie mistakes in the field of battle. He is a 4th year manager now and needs to act like it. Stop making decisions that I can do better with from my armchair(I took care of a few commenting readers with that phrase). *Jason Heyward has a breakout season in his first year in Cardinal Red. I like the kid. I like Heyward a lot. I think he is the right fielder this team has dreamed about for years. He is 25 years old, has shown the ability to hit the long ball and has a great head on his shoulders. He is a PR dream and an athletic specimen. He is going to play for the perfect team in the perfect place. Fans will eat him up and that smile as wide as the Arch. I want him to sign an extension and stay a while. Worry about playing time for Randal Grichuk and Stephen Piscotty later. They are young, raw and need time. Heyward’s time is now. *Matt Holliday cranks 30 home runs. I know. Home runs aren’t Holliday’s forte. He does a variety of things with the bat and I am not asking for a lot here. I want Holliday to bash 30 home runs to go with his .300 average, .380 on base, 100 RBI and improved defense so stingy fans can find even less to complain about. 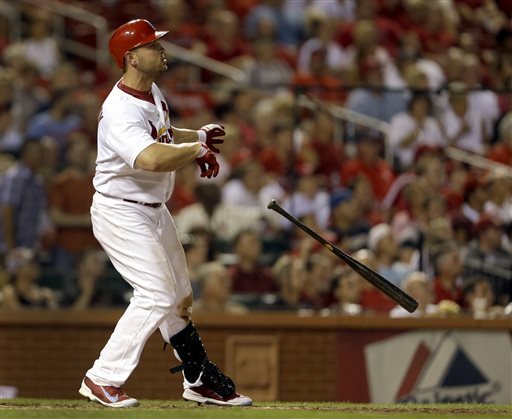 Holliday is getting older and younger men are barking behind the wall in left field but he is still a highly productive player in this game and has made his at the time big dollar contract stand tall for John Mozeliak and the Cardinals. I want him to crank a few more long balls this year just to let it all soak into the crowd who thinks he isn’t worth the money. Just for a few extra grins. *Michael Wacha bounces back and shows a full bill of health. The ascension of Lance Lynn and the presence of John Lackey is nice but if Wacha is anywhere close to his 2013 form, the Cards rotation is deadly and ferocious. Opposing teams won’t find an easy cure in this group, especially if Carlos Martinez wraps up the fifth spot. On paper, the Cards have loads of starting pitching. Along with the five previously mentioned arms, they also have Jaime Garcia on the mend and Marco Gonzales waiting with Tim Cooney, Tyler Lyons and John Gast on the farm. Look closer and the walls shows a few crack though. Adam Wainwright is coming off a season where he dominated at times and also ran into dead arm issues. Lackey’s health will be in question. Martinez barely has any experience in the rotation. Garcia is as fragile as a faberge egg. If Wacha is good to go and all the way back from a stress reaction, the rotation is strong.If not, don’t hold your breath on the disabled list area staying empty. *Yadier Molina plays 150 games, and catches 100 percent of them. For now, ladies and gentlemen, the man is too good of a backstopper to move to first base. His knees are fragile and have a timer on them, but that doesn’t mean you move a gold glove caliber defender to another position to worry about tomorrow or next year. Yadi behind homeplate makes the Cardinals a perennial threat. Unless they sign another Yoda to back him up or create magical powers with Tony Cruz, Molina can’t move. The pitching staff, coaches and Matheny lean on him to be a difference maker. The Cards are a better team with Yadi catching and not at first base. *The bench becomes a weapon. Mark Reynolds and Grichuk combine forces to give the Cards an all or nothing swing for the fences in the late innings is a good start, but I want more. I want these utility players to turn a weakness into a strength in 2015 as a unit. Make the bench a tool instead of a leaky faucet. Opposing managers knew the Cards were playing with less than stellar late inning power so they unleashed the hounds most of the time early. The walk off wins didn’t pile on until August and September. A bench makes all the difference for a team that doesn’t hit for a lot of power and wins close games. Something in the stadium to remember Oscar Taveras by. A small #18 in the right field bullpen. A picture or plague somewhere in the stadium. A place where fans can see that exuberant smile and ambition when they visit the stadium. It doesn’t have to be show stopping. That or Carlos wins 18 games to truly honor Oscar. Jordan Walden makes fans forget about Jason Motte and Pat Neshek really quick. Jhonny Peralta remains stellar at shortstop. Kolten Wong steal 30 bases. Trevor Rosenthal‘s pitches per inning go back down. The Cards play winning baseball at Wrigley Field. Instant replay gets a little better. Lance Lynn wins 18 games, pitches 200 innings and posts a fielding independent ERA below 3.00. That should do it. There are a lot more wishes to throw into the well but it’s still 2014 and it’s Christmas. The temperature outside is 59 degrees. I think it’s time for me go outside. Next Post: How Do You Work This Thing Again?